As of 4:30 this afternoon, I can add ABD to my email signature (though I probably won't). I don't think I passed my oral exams elegantly or with flying colors, but I did pass. I'm fairly certain that one of my examiners passed me just to be rid of me. I celebrated by going to Mount Auburn for the first time all summer. 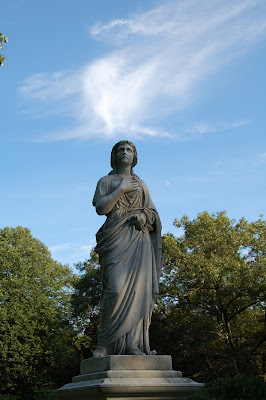 This monument caught my eye, perhaps because she reminded me of Dumbledore and his Pensieve. Since I don't have a pensieve, I'll have to empty my mind with a long weekend of ice cream and video games. That is way too cool!! Enjoy your well earned weekend of ice cream and video games!! I seem to remember that at this point you can fill out some optional paperwork and get a genuine M.A. awarded -- that's a lot better after your name than ABD. And it makes you an honest to goodness Harvard alumna. Yes, I can get my M.A. now. If I wait until spring semester, I wonder if I'll get graduation tickets. Those are worth a tidy sum around here.